Where did 2017 go? Now that we are well into the New Year of 2018, this is the year I hope to be making even higher quality compost to spruce up my garden this spring. This article will be dedicated to the use of biochar as a “carbon” source for making the highest quality compost consisting of all the nutrients plants require and teaming them up with beneficial microbes (bacteria and fungi). You may already know something about biochar — how it is made and its claims to be a soil enhancing agent — but understanding exactly how it enhances soils for plants will help you to know how it can be used most profitably in soils and in compost making. 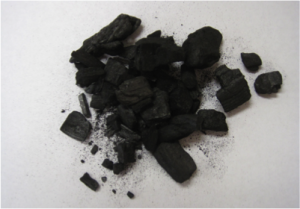 A good quality biochar will be granulated down to particle sizes of 1mm to 5mm, and will have very few, if any, chunks larger than a half inch and very little dust. Large chucks of biochar are not as effective in soils and composts as the fine textured (1 mm to 5 mm) material on the right. The organic carbon and porous cavities in the biochar will attract beneficial microbes such as nitrogen fixing bacteria and nutrient transporting fungi such as arbuscular or endo-mycorrhizal fungi. 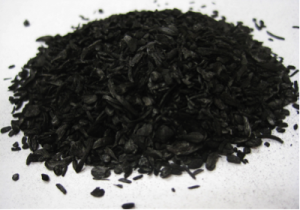 Biochar’s surface area has both negative and positive charges that attract positive and negative charged nutrient ions like nitrogen, phosphorous, potassium, magnesium, calcium, and other micronutrients. During the compost making process, these nutrients have the potential to leach through the compost pile and be lost. 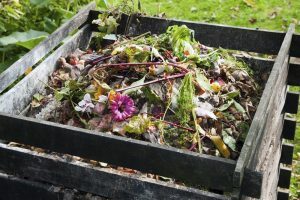 Microbes that are attracted to and protected by the biochar also have the opportunity to incorporate these nutrients into their body mass and wastes and upon their expiration, these nutrients are retained in the compost and will be more available to plants as food. The negatively charged biochar surface area can also increase the amount of hydrogen ions in the soil causing the pH to increase, which may be beneficial for some plants and not for others. This “liming” effect may beneficially treat acidic soils. If acidic-soil-loving plants are being grown, such as Begonias, Blueberries, Dogwood, Fuchsia, Holies, Hyrdrangeas, Magnolias, this negative impact can be overcome by adding a soil acidifier like Aluminum Sulphate at a rate of about 2.2 lbs (1 kg) per 200 sq. ft. (20 m2). The benefits of adding biochar to soils and compost becomes very interesting when we begin to consider its positive effects on soil microbes. The small pores of biochar provide a hiding place for fungi and bacteria that protects them from grazing protozoa, such as amoebas and nematodes. When beneficial bacteria and fungi populations increase in the soil, pathogenic bacteria populations decrease and plant health is improved as a result. 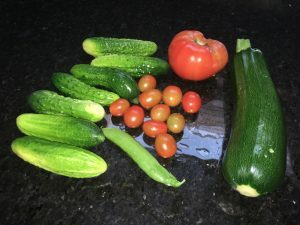 So, given the significance of Soil Organic Matter (SOM) for soil health and the ability for biochar additions to compost to increase this important soil quality, let’s take a closer look at this synergy. An application of well-made compost to soil provides easily accessible carbohydrates for soil organisms and ionized nutrients for plants. Larger soil organisms like earthworms are also positively influenced and these in turn have a positive impact on soil health through their ability to blend the soil (a process called bioturbation) and produce droppings (worm castings) consisting of organo-mineral complexes that are beneficial for plants. Addition of biochar during the composting process increases all of these prospects as discussed in the second reference given above. I have summarized some of this information in the following notes relating to addition of biochar to the residential composting process. Biochar’s excellent nutrient and moisture holding capacity along with its ability to stimulate and protect the growth of beneficial plant microbes is fully utilized when it is blending with compost. 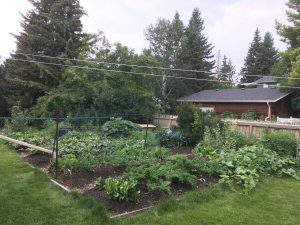 A number of important research studies are underway to quantify the numerous ways in which blending compost and biochar results in a soil amendment product that is richer in microbes and nutrients along with the benefit of a more resilient soil organic carbon material that is long lasting in a garden, turf, or crop lands. Addition of biochar to the composting process is a technique used by Indigenous people in the Amazon basin some 2000 years ago. Reference 2 lists a number of potential benefits of including biochar in the composting process that are currently the subject of considerable research. Some of these benefits are listed below. Because of the higher temperatures encountered during the composting process, “surface oxidation (that occurs when biochar is included in the process) will enhance the capacity of biochar to chemisorb nutrients, minerals, and dissolved organic matter. It is further postulated that this increases the reactivity of the biochar surfaces. There is evidence that biochar, as a bulking agent, improves oxygen availability and hence stimulates microbial growth and respiration rates. Furthermore, biochar in compost provides habitates for microbes, thereby enhancing microbial activity. Biochar-amended composts are reported to have increased moisture absorption, which is beneficial to the composting process as well. Applications of compost only to soils will result in more rapid mineralization and require replenishment sooner than applications of compost-biochar mixtures. Reference 2 also mentions a series of crop trials involving oats on sandy (trial 1) and loamy (trial 2) soils. Biochar was added to compost at rates of 0, 3, 5, and 10 kg per ton of compost. Plant growth was generally increased with increased amendments of biochar/compost blends. The impact is greatest for sandy soil or nutrient-poor soils compared to loamy soils. What is surprising is the impact of these relatively low biochar application rates. Figure 7 in Reference 2 indicates as much as a 100% increase in yields with the addition of only 10 kg of biochar per ton of compost. The overall conclusion of the research reviewed and conducted in Reference 2 suggests that there is “optimism for synergistic effects of compost and biochar technologies for ecosystem services and for sustainable management of natural resources including organic wastes. What does all this mean for future biochar amendments for my garden? Well, I will be incorporating biochar into my composting process to enhance the retention of nutrients and microbial activity to enhance my future soil amendments! Stay tuned for more results of compost and biochar blending experiments as they become available here! Welcome back to the SoilMatrix Newsletter. This issue provides a short set of videos to demonstrate how much research is taking place around the world on the topic of using biochar as a soil enhancement agent and as a way to mitigate CO2 emissions to the atmosphere by CO2 sequestration in the form of carbon. This was one of the identified unknowns in our July Newsletter. Most climate change measures such as driving an electric vehicle, switching incandescent light bulbs to LED lighting, installing solar panels, geological sequestration of coal fired power plant CO2 emissions, and so on, are considered to be carbon neutral activities. 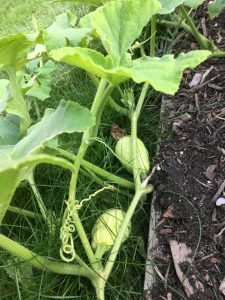 In this edition of the SoilMatrix Newsletter, you will learn how using biochar to enhance your lawn and garden soil, or your farm soil or any soil, actually REMOVES CO2 from the atmosphere by sequestering carbon into soils for 100’s to 1000’s of years. The following series of short videos were made available by the UK Biochar Research Centre of The University of Edinburgh. They are evidence of the amount of effort being put towards answering questions relating to the use of biochar for soil enhancement and CO2 emissions reduction. My hope in sharing these videos is to demonstrate how a large number of researchers around our planet are now investigating both the benefits biochar has for soils and the effectiveness of long term sequestration of carbon in soils to mitigate climate change. Thank you for your interest in this topic. We will see you at the end of October.